Cotton and Jute and Hemp…Oh My! Do you ever find yourself pondering over the differences between hemp and jute, or bonded leather and genuine leather? With so many eco-friendly materials in the marketplace, it’s easy to get overwhelmed by your options. But don’t fret, you’ve come to the right place! 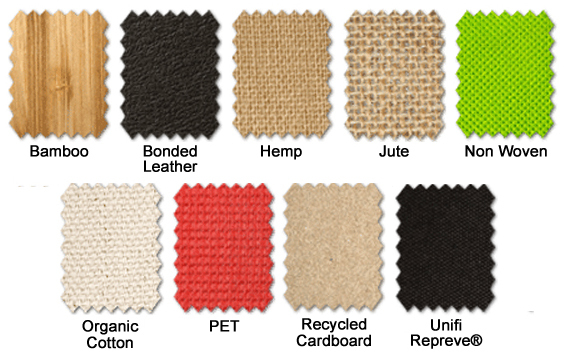 This brief guide provides you with simple descriptions and reference swatches for some of our most popular eco materials. As the fastest growing woody plant in the world, bamboo is a tall, hollow grass with a wide range of uses. It can be treated to become a hard wood-like material that is both lightweight and durable, or its pulp can be spun into a fibre to create yarns and fabrics. In addition to being anti-bacterial and anti-microbial, bamboo does not require large amounts of water or pesticides. Made from recycled leather scraps, bonded leather has a look and feel that is similar to that of genuine leather, but at a fraction of the cost. Bonded leather is an affordable and eco-friendly option with a high perceived value. Described as an environmental “super fibre”, hemp is a high-yield crop that requires no pesticides or herbicides. In addition to its supple texture, hemp is a durable material that is eight times stronger than cotton. Jute is a long, shiny plant fibre that can be spun into coarse, strong threads. As one of the most economical natural fibres, it’s second only to cotton in the amount produced and the variety of uses. In addition to having bio-degradable properties, no hazardous chemicals are used in the growing or manufacturing process. Non Woven fabric consists of flat and porous sheet or web structures that are bonded together mechanically by entangling recycled fibres. Noted for its durability and economical price point, this extremely popular material is available in a variety of weights and colours. Our Non-Woven products contain 25% recycled materials and they are also #5 PP recyclable (blue box friendly where accepted). Organic cotton is grown using methods and materials that have a low impact on the environment. Although it is more expensive than conventional cotton, it is grown without pesticides, herbicides, insecticides, chemical fertilizers, or any other chemicals that may be harmful to the environment. Post-consumer recycled Polyethylene Terephthalate, commonly known as PET, is made from plastic products, such as soda or water bottles, that were previously used and then recycled. Its use drastically reduces the amount of plastic in our landfills. Recycled paper is made from old paper products. Producing recycled paper requires roughly half the energy than that of non-recycled, and it creates less water and air pollution than conventional paper processing. A man-made yarn produced from 51% recycled material, Unifi Repreve consists of a mixture of pre-consumer (unused fabric generated during production) and post-consumer (plastic bottles) recycled materials. The production process of Unifi Repreve conserves energy and reduces greenhouse gas (CO2 emissions) by 92%. Maximize Your Message With A Green Impact! Don’t forget, Earth Day is right around the corner. Contact your DEBCO Account Manager or Sales Representative to learn more about our comprehensive line of eco-friendly promotional products. This entry was posted in Eco-Friendly Products and tagged Advertising Specialty, Bamboo, Bonded Leather, Eco-Conscious, Eco-Friendly, Hemp, Jute, Marketing, Non-Woven, Organic Cotton, PET, product solutions, Recycled Cardboard, Recycled Paper Accessories, Swag, Unifi Repreve by Debco. Bookmark the permalink.